Another successful day on the water with Hookers Fly Shop and Guide Service | Hookers Fly Shop and Guide Service. Your Smokies Fly Fishing Experience. Guided the Cherokee Trophy water this morning with a repeat client and good friend of mine. Will W. from Birmingham, AL landed some nice rainbows and missed a few nice ones as well. 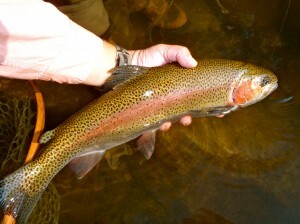 Fish were taken on #18 Griffiths Gnats and a #8 Lowe’s V-Rib Stone Fly variation with flashback and UV dubbing. Overall a great day on the water with some good company. Looking forward to a busy busy weekend here at the shop. 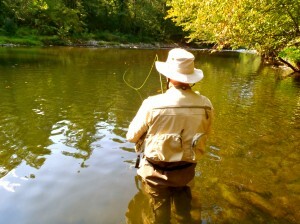 Several trips already booked for Saturday and a smallmouth float trip on Sunday.